In the halcyon days of 2001 Jak and Daxter leapt onto the scene, showing us what plucky developer Naughty Dog could do with the horsepower afforded by Sony's (at the time) epic PlayStation 2. Much time has passed, and while Naughty Dog has gone on to bigger and better things (Uncharted and The Last of Us) while video game mascots have all but disappeared, the new PlayStation Vita incarnation of the classic Jak and Daxter trilogy attempts to distill three games worth of epic adventures into a portable package. Does it work? Let's find out. 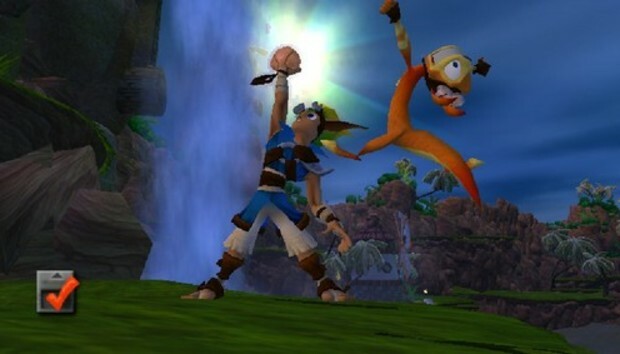 The games in the Jak and Daxter series are very much a product of their times. The original Jak and Daxter hearkens back to that golden era of collectathons, when the pinnacle of game design meant grabbing everything that wasn't nailed down to fill out lots of lists. By Jak II the Grand Theft Auto-effect is in full swing: bright colorful jungles and islands are replaced by a sad, grungy city, and you'll be jacking cars within the first hour. By the third, the platforming elements have seemingly faded into background, with so much more of the experience revolving around gunplay and racing dune buggies across desert landscapes. I really recommend traipsing through the adventures in order. You'll get a good feel for how developer Naughty Dog's storytelling and animation chops have evolved over time, and an even better idea of where the game design prowess that absolutely shines in the Uncharted series first reared its head. The Jak and Daxter games are phenomenal, retaining the essence of the quintessential 3D platforming experience while turning standard conventions on their heads. The massive worlds are largely non-linear, and while your progress is generally gated by the story--befriending the right NPC, or collecting a particular number of items--you're free to traipse about as you see fit, exploring every nook and cranny or simply doing the bare minimum to push the story along. There's also a neat nod to immersion, with "levels" such as they are broken up by intricate door-opening animations or trips on vehicles and the like, to mask loading times. It's a simple touch, but still a far better experience than the myriad of loading screens we still have to deal with to this day. And the story. The story is wonderful. Things start off a bit juvenile, what with the typical fetch quests that I've always found a bit confusing in light of the grander narrative. I'm on a mission to save the village/city/world, and you want me to run meaningless errands before handing over that bauble I so desperately need? Daxter--he's the otter/weasel critter--plays comic relief, and I always found his excited hammering to be a bit grating on the nerves. I'm also not much a fan of his brand of humor and incessant one-liners, but to each his or her own I suppose. But the rest of the experience is a visual and aural feast, mysterious races and their hitherto misunderstood technology, and you, as Jak, plundering it for all the wrong reasons. The level of animation was incredible at the time, a standard Naughty Dog has continued to this day. The Jak and Daxter collection gives the games a bit of a sprucing up, serving up higher resolution textures and the like. The first game in the series looks phenomenal, it's cartoonish aesthetic and simple models lending itself well to a bit of visual polish. The newer games' focus on being all dour and mature actually stumble a bit here, with their aesthetically complex cities and structures coming off as a bit blocky and murky. And to think, three PlayStation 2 discs worth of adventure all fits on a miniscule PlayStation Vita cartridge! You should totally get this--on the PlayStation 3. The collection was released for Sony's less-portable console in February 2012, and a great way to while away a few hours on the couch. The PlayStation Vita version is essentially its equal, albeit often running at a noticeably slower frame rate during the more frenetic scenes, and lacking the PlayStation 3's support for 3D playback. But the Vita version has one big problem: the developers chose to map one of the primary camera controls to the Vita's rear touchpad. Since the Vita doesn't have a secondary set of shoulder buttons, the control that would normally shift the game's camera into a static, first-person perspective was slapped onto the right side of the rear touchpad. Now, imagine you're leaping over dunes in a buggy, or dashing through a particularly hairy series of jumps. Your grip on the Vita shifts a bit, because I dunno, you're human. Once your hand grazes that rear touchpad, your character is immediately rooted into place as the movement controls now cause you to look about. If you're lucky, you'll just need to tap the screen again and continue on your way. If you're racing, you might not even mind the sudden change in perspective, and have already righted yourself and can continue veering through those curves. But more often than not, that sudden switch in control scheme halted whatever action you were in the middle of doing, sending you careening into a pit or forcing you to restart whatever puzzle or boss fight you were working on. It's a simple fix: adjust your grip on the Vita so that you aren't touching the gamepad--I have large hands, but I can generally make it work. But that's a problem. It's a rear touchpad, so I can't actually see it, but I know that it's there, lurking. And whenever a tricky ascent or challenging race rears its ugly head, I find myself focused on keeping my hands well away from the rear of the console, instead of whatever's actually happening on screen. This is my biggest gripe with the Jak and Daxter Collection on the Vita. I can get over the occasional dips in framerate, or the fact that these epic adventures and expansive worlds don't quite fit on a screen this small. I can even get over some of the more comical errors, like the vestigial vibration settings left in the settings menu. It's a simple issue, but it speaks to a fundamental problem with the console, and especially to porting older PlayStation titles games over. I mean... couldn't the developers have put that toggle on the front-facing touch screen? It strikes me as a much more logical place, and there's no danger of hitting it unless you mean to. And of course there's no way to re-configure the controls to something a little less annoying, so you're stuck trying to enjoy the experience, all the while mindful of the Vita's casual indifference to how cramped your hands might be feeling. Which is a shame, really. A lovely series that's all about precise control, laid low by modernity's need to slap touchscreens onto everything. There's a lesson in there somewhere, but I won't waste your time trying to find it. I'd recommend picking this up only if you absolutely need to relieve this experience and only a portable package will do. If it's your first jaunt into the world of Jak and Daxter, your hands and eyes will thank you for picking up the PlayStation 3 incarnation instead.